In addition to 25 Cash Prizes, You can also win 3 Chess.com Diamond Memberships each worth more than ₹7000. The Entry fees for the players is ₹500/- The Deadline for registration is October 6, 2018 at 5pm IST. Kindly note, Only Indian players can participate in this event. The tournament format is a 10-round Swiss with a time control of three minutes plus two seconds increment per move.The tournament begins at 7pm IST on Sunday, October 7 and is expected to go on for about 2.5 hours. *The entry fees is ₹500 per player. Deadline for registration is 5pm IST on October 6, 2018. You can create one or contact us and we will create an account for you. You must have a Chess.com id. Only Indian Players can participate. Tournament will be conducted as a 10 round Swiss ~3 Mins + 2 seconds increment per move. Organizers reserve the right to refuse an entry without giving any reason. Entry Fees once paid won't be refunded. The provisional standings of the tournament will be displayed immediately after the last round but the final rankings will displayed after a thorough check is completed for all the games played. Once final standings are determined, players will be contacted by staff and the payments will be done by Bank transfer. Every participant agrees to abide by the rules and site policies found at chess.com/legal and that you will cooperate fully with Chess.com's fair play detection team. Should your play be found suspicious to warrant playing for cash prizes, you maybe removed from the tournament while it is in progress. If your account is further convicted of fair-play violations, your account will be closed and you will be subject to Chess.com's private proceedings. You can find more information on Chess.com Fair Play and Cheat Detection methods. 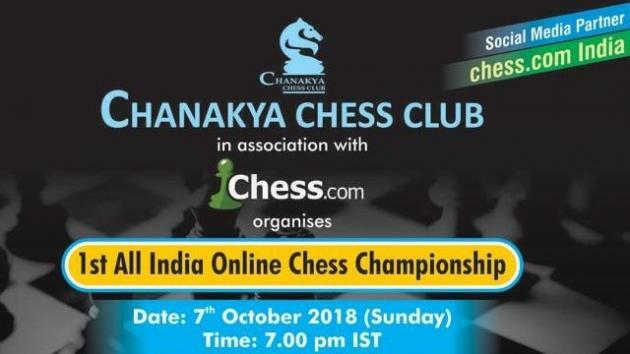 Chess.com India will be the Social Media Partner for this event. Thank you All and Good Luck! May be the Best Player Win!